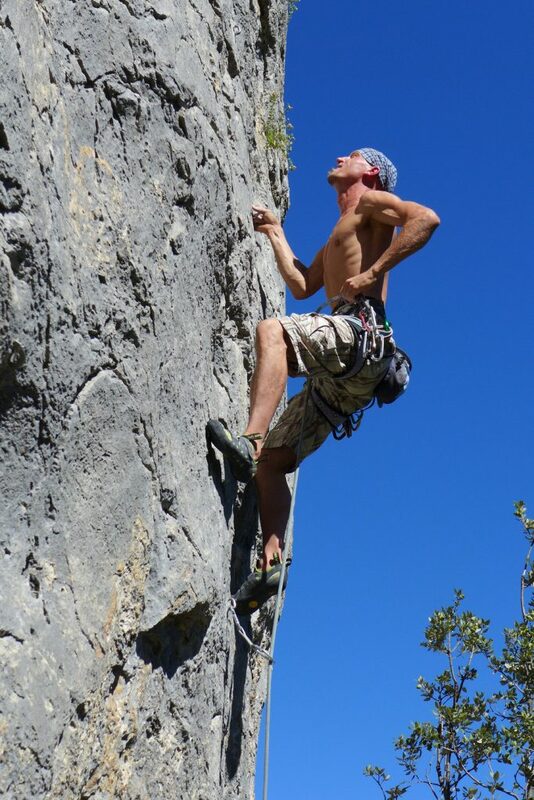 Have you ever thought about what it would be like to create your own rock climbing movie? Probably not, right? Such ideas do not simply pop into your head unless someone else provokes them. Find out which movie I first chose out of frustration, what is behind the thought process of "your own climbing movie" and why I find the idea of more relaxed climbing to be very helpful. I had not been climbing for the past five months and now that I have returned to the rock, things go not as smoothly as I had hoped. Even though I am trying to approach the climb as calmly as possible, I can feel the pressure building in the back of my mind. All self-inflicted, of course. It is then that I remember an exercise that may just help me to reduce this pressure. 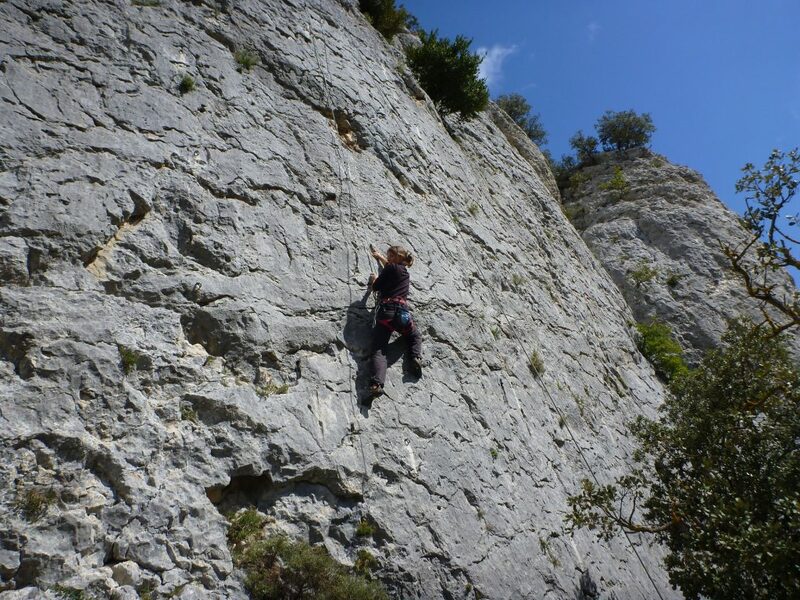 Climbing in Peñartea, close to Pamplona, northern Spain. It's a gorgeous climbing spot. However, I'm not paying too much attention to the area, but rather to what's not working. When I read this message on Facebook, I had just come back from another frustrating climb, which is why I chose the title “Titanic”. I had virtually tanked on my routes, hence a great choice for a title. When reading some of the other answers, I had to laugh. Cast Away, The Falling, Rebel Without a Cause or Mission Impossible were just a few of them. Even though the climb did not go well, I at least could smile again and view everything from a humorous perspective. That's exactly what I do not seem to be able to do during my climb. I put pressure on myself and am not satisfied with my performance. “This is only a 5c and I do not see any land? That simply can't be true”, were some of my friendlier thoughts. I often talk about being patient and to be kind to yourself and now this. Instead of approaching the climb more relaxed after my five-month hiatus, I get stressed out. After all, my boyfriend took a similar break from climbing after he had broken his hand in May and things are going great for him! And voilà, I fall into the comparison trap. My boyfriend Steve is climbing with ease, whereas I'm struggling. It's difficult not to compare myself to him, although I know it doesn't help. The game with the movie titles made me remember an exercise I got to know a few weeks earlier during training concerning fear of heights. During this exercise, one acts as if and the goal is to broaden one's behavior repertoire by taking on a new role. If I get scared during a steep climb getting to the crag, my body posture becomes very cramped, which does not help me mastering those passages in a safe manner, which is why I have been given the task to imagine I am a proud queen who gracefully walks along the path. Granted, this did not mean that I jumped over the steep section like a deer, which would have been too good to be true. A change in my body language became visible, however, which also led to a change in my feelings. 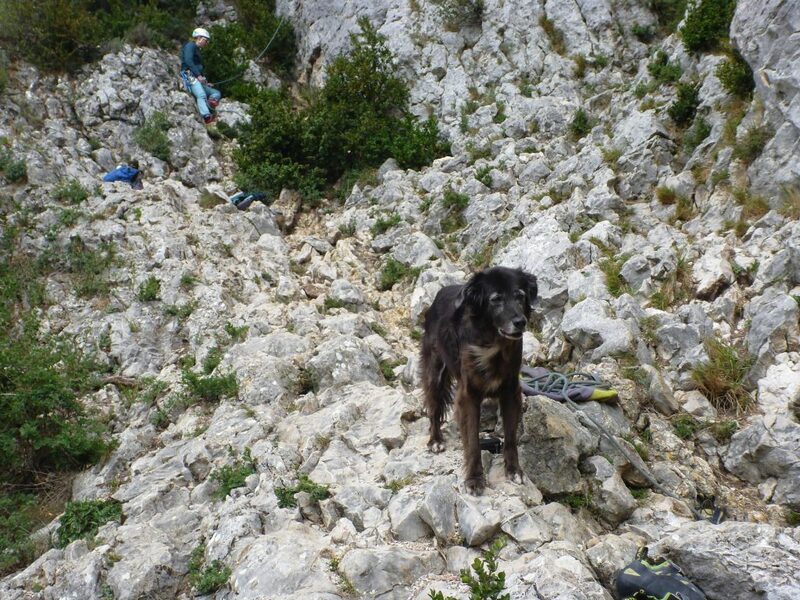 My dog Luna doesn't have any problem with steep paths. I do! Changing my body posture and signalizing more confidence is odd, I need some time to get used to it. The body and feelings are closely connected after all. Changes to one lead to changes in the other one as well. Progressive muscle relaxation uses this principle as well. By relaxing my body I also release mental tensions. Another advantage of this exercise was that I had something I could concentrate on meaning my sole focus was no longer the perception of fear. What would your own climbing movie look like? In order for my next climb to be more relaxed, I come up with an idea. Instead of choosing a movie title afterwards, how about choosing one beforehand? Exactly like during the exercise during the training concerning fear of heights, I simply choose a movie that motivates me. Instead of stressing myself out, how about a comedy? Why not try a humorous approach? Why not take on another role and try it out? Climbing is supposed to be fun and not self-induced pressure. Maybe the role of Lara Croft or Batman would suit you? Obviously, other movie characters that inspire you would work as well. What I am trying to say here is that your thoughts influence your actions. Change your thinking and you will change your actions. If not a climbing movie, which song would be suitable for climbing? If you really cannot envision the climbing movie scenario and prefer music, simply pick a suitable song. A song that puts you in a good mood or that gives you a push. Anything that makes you feel great! The advantage of a song is that you can hum or sing it during climbing, hopefully quietly enough so that no one can hear it. Singing helps relieve fear because it prolongs breathing out which signals to your body that everything is okay. For my next climbing expedition, I will not only take food and drinks but also a list with suggestions. Yes, I will actually write them down so that I no longer have to think about them and have them readily available to me. You can also turn this into a neat game during which the climbing partners draw a piece of paper with various adjectives on it. Whether they draw graceful, elegant, determined, playful, conscious or fearless - you will definitely have fun!